Now here's someplace you won't find any visitors dining at: Leeward Drive Inn. And it's not because the place isn't any good, but because it's kind of off the beaten path. When I travel, I like to try to experience a local through its food. And Hawaii has an excellent place to get your feet wet at called Zippy's. But, while I love Zippy's, they're a jack of all trades and a master of none. But this place, Leeward Drive Inn, excels at a specific local favorite: fried noodles. Leeward Drive Inn is located in the town of Waipahu, which sits between Pearl City and Ewa. This is not somewhere visitors to the islands typically visit, and even some locals don't like the area. You will, however, pass by on the freeway if you're going to Ko Olina to stay at Aulani, the Four Seasons, etc. ; or even if you're going to Ewa to take a ride on with the Hawaiian Railway Society. In fact, Leeward Drive-Inn would make an excellent stop for lunch on your way out to the train or Ko Olina. But finding it could prove to be challenging. As its name suggests, Leeward Drive Inn is a casual, drive-in restaurant. However, it's in a strip mall and looks more like a walk-up takeout window with some benches out front. And, basically, that's what it is. Walk up, place your order, pay, and wait. Parking is anywhere in the lot out front, though things can get tight at peak hours. Credit cards are accepted, but you need to place a minimum $10 order. 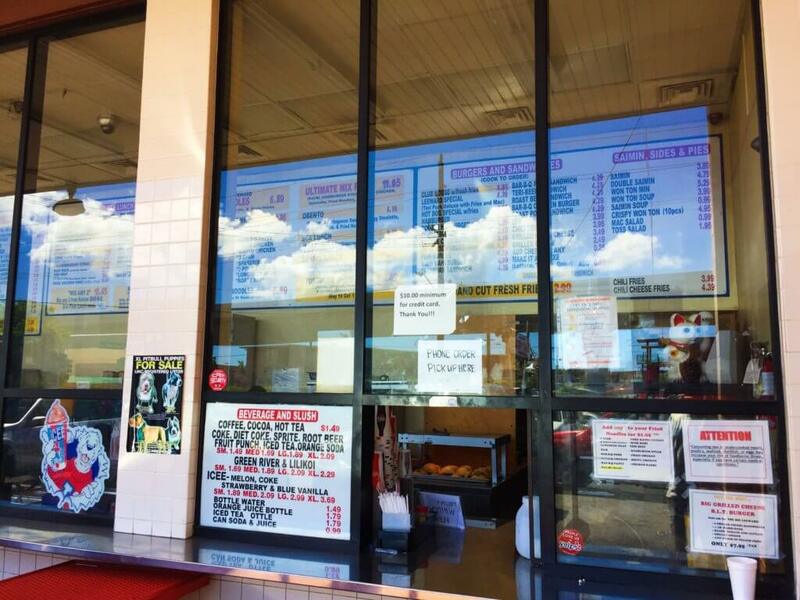 Leeward Drive Inn has an extensive menu, and there are other items on the menu that people love. But for me, dining here is all about the fried saimin, also known as fried noodles. Saimin, for the uninitiated, is a plantation-era invention that's a mishmash of Chinese noodles, Japanese dashi, and toppings from various cultures. And here, they do things just right. At Leeward Drive Inn, they keep things simple with a springy, wavey saimin noodle, minced char siu (roast pork) and kamaboko (fish cake), and green onions. You can add any meat you like for an extra $1, except for the kalbi (pictured; grilled and marinated Korean short ribs) which are an extra $2.50. And add a side of syrupy, sweet, neon-green, Green River (lemon-lime juice) for an extra shot of local nostalgia. The noodles here are perfectly done, with a nice, al dente bite to them. There isn't a specific flavor, but it is savory-salty, with a hint of sweetness from the char siu and kamaboko, and a mild onion zing from the green onions. The kalbi adds a nice smoky, savory +sweet, meatiness to the dish and makes it more of a "complete meal." I love Leeward Drive Inn and is someplace I'll drive to just to grab a bite to eat. And if you really want to get a taste for something that's uniquely local, it someplace I highly recommend checking out. 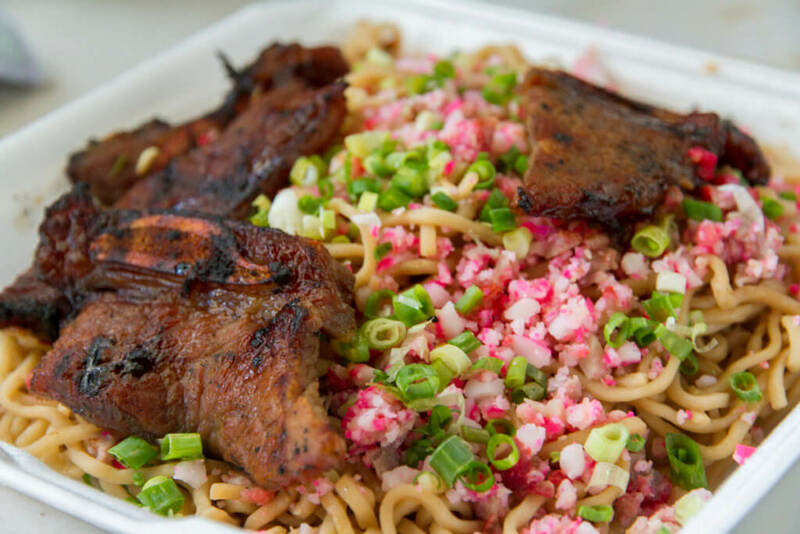 Saimin, after all, is one of Hawaii's most iconic dishes; a melting pot of different ethnicities. And the fried version is a further evolution of a beloved local favorite. Plus, unlike more haute locations, Leeward Drive Inn keeps thing unabashedly simple and true. And don't believe me about the customers being mostly local? Just check out their TripAdvisor and Yelp pages. Yum. Trust the locals for sure...they know where the good food is at! I also love Zippy's...we always stop on the way in/out of Maui since it isn't too far from the Airport on main roads/intersection. Keep em coming kharada46! I thought I'd share a few of my favorite places in SF. Starting with a restaurant in the Sunset district. The restaurant's name is Lam Hoa Thuan, located on 2337 Irving St. (between 25th & 26th Ave). Most locals thought this restaurant has the best char siu and roast duck. For me, I only like their char siu. I'm a big fan of desserts and sweets, so of course, the 2nd place is the Golden Gate bakery (on Grant Ave. between Jackson & Pacific) in Chinatown. But for this place, I only like their egg custard tarts (love it more when it just come out of the oven). And egg custards are never my favorite dessert...but I will always drop by to have one whenever I don't see a long line waiting outside. Lastly, if you like French pastries, you might want to give this one a try. Arsicault, 397 Arguello Blvd. just around the corner of Clement. I'm not a big fan of chocolate croissants, but their chocolate almond croissant was pretty good along with the ham & cheese croissant especially when it's still hot. I believe 3 years ago, the Bon Appetite magazine named Arsicault the best bakery in the Nation. Perhaps, you may already knew of these places and have already tried it. But just in case it never made it to your list yet. Cheers. Thanks for sharing yclau! I've never heard of any of them before, so I'll definitely have to look them up. In fact, the only bakery on my list right now is B. Patisserie, because I want to visit the mothership of what's quickly become my favorite bakery in Hawaii, Kona Coffee Purveyors + B. Patisserie. So, thanks again for the recommendations! I just read your most recent review on B. Patisserie, and I plan to check it out this afternoon only because I just have to compare their croissants to Arsicault's croissants. The banana chocolate almond one will probably be the first one I'd try. Hey, I learned something new today. I never knew the location of Arsicault is considered to be in the Laurel Height area. I had always assumed that it'd be in the Inner Richmond district. But of course, what do I really know about geography. Have a nice weekend!! !